I came across Kent Wang on (where else) Style Forum. 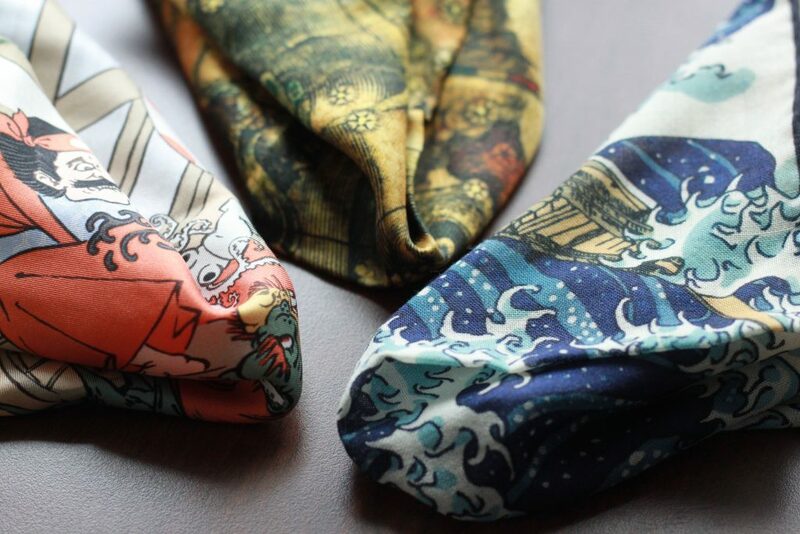 They have some really attractive pocket squares at very reasonable prices. In fact, Kent Wang in general offers a number of great products at reasonable prices (grenadine ties, sunglasses, etc.). The Rickshaw Cart I wrote about in a one square, four ways post and it is definitely a favourite. Taurus Orion is a beautiful stylized depiction of the constellations of the same name. The Great Wave is based off of a wood-block print titled “The Great Wave off Kanagawa” by Katsushika Hokusai, a Japanese artist from the late Edo period (early 1800s). This square is probably my most worn, and the first square I would recommend after a white linen. Here is a closer shot – note the added texture to the wool/silk blend of the Great Wave. On both the silk and wool/silk blend pocket squares, the colours are rich and vibrant, without being overly saturated. The rolled edges are finished wonderfully and with the contrast border on each of these it adds some extra options when folding corners up. 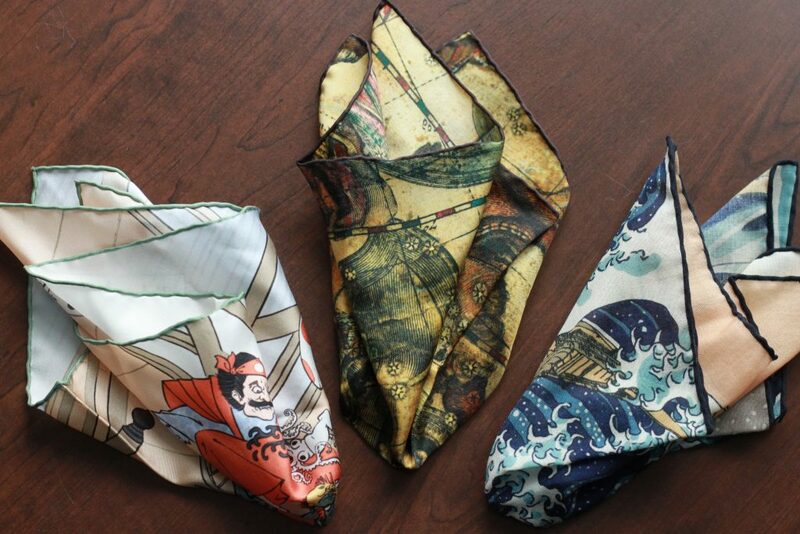 I see that Kent Wang has started to introduce larger sizes on many of their pocket squares – 13″ is standard, 17″ is large. I think I would prefer to see a standard size of 15″ or so, as 13″ sometimes fall down into the breast pocket of my jacket, and larger squares in the 17″ often cause a bit of a bulge. The wool/silk blend is noticeably better at staying where I put it due to the texture, so if you’re considering any pocket squares in that blend you’re probably ok to stick with the standard size. Overall, I think these squares are some of the best value out there – excellent materials and construction, beautiful (and some original) designs, and a great selection of versatile colours. I look forward to expanding my collection.